The Hudson Valley UFO account is composed of not one, but many sightings, all similar, and all pointing to one conclusion. There was something "unexplained" going on in this place only an hour's drive north of New York City. The Hudson Valley UFO saga began at almost the beginning of a new year, 1982. Just a short time before midnight, December 31, 1981, a retired policeman was sitting in his backyard in Kent, N. Y. He saw a group of strange lights to the south. The lights were a brilliant red, green, and white, and at first, he thought they could be coming from an airplane in trouble. It was common for him to sit and watch the big jets fly over at night. As the lights became closer, his opinion quickly changed. The lights were moving too slowly to be a plane, and now...they were too low, and there was no noise from an engine. What was the strange craft he was seeing? As the lighs came closer, he could hear a humming sound, and now he could see that the lights were arranged in a triangular shape, and there was a solid object of some kind connecting the lights. No, this was no aircraft he had ever seen before! The solid part looked like... like... a fuselage. That's what it was a fuselage. He was looking at a UFO. This type of report would be repeated many times in the Hudson Valley over the next few years. All of them were familiar, a V-shaped row of lights connected by a solid object of some type. Literally hundreds of witnesses would see this same sight. There was definitely something unusual going on in the skies over the Hudson Valley. Something that moved ever so slowly, so silently. On March 26, 1983, an article about the sightings appeared on the front page of the Westchester-Rockland Daily Item. The article recounted the many reports of the strange phenomena. The cat was out of the bag. The press coverage drew the attention of a group of UFO investigators which was associated with Dr. J. Allen Hynek, acclaimed scientist and UFO investigator. 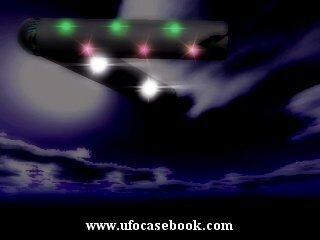 A thorough investigation followed, and ultimately a book, "Night Siege: The Hudson Valley UFO Sightings," written by Dr. Hynek and Philip J. Imbrogno. The group began their inquiries by setting up a phone hotline. They received over 300 calls from individuals who had seen the strange V-shaped lights on the night of March 24, 1983 alone. Descriptions were very similar, if not identical. The object always moved slowly, and almost silently. It always had many lights, and they were always in a V-configuration. Some of the witnesses got a close enough look to say that the craft was large enough to be a "flying city." On the same night, the city of Yorktown also came alive with reports of this giant flying craft. The police switchboard was jammed with so many calls about the UFO that they feared not being able to respond to "real emergencies." Drivers pulled over on the Taconic parkway to watch the large object slowly make it's way across the skies. All in all, about 5,000 reports were made during a period of five years, from 1982 through 1986. The object was seen by multiple witnesses at night, but never was a report made of it appearing during daylight hours. The sightings ranged as far east as New Haven, Connecticut, and as far north as Brookfield, Connecticut. Several theories were put forth about whether there was only one object, or many. Some additional accounts would come forward stating that the object, though moving slowly, would at times make a rapid, fast maneuver from one location to another. Also the lights of the craft could change colors in an instant. A report made from guards at the Indian Point Nuclear Plant would be one of the most dramatic. The gigantic UFO was seen hovering over the plant for periods of time, and moved as close as 30 feet from the reactor. Security supervisors even once considered ordering in planes to have it show down. The object over Indian Point was described by some of the guards as 1,000 ft. long. Another witness described the object hovering over the Croton Falls Reservoir, using a red beam as it seemed to scan the surface of the water. Reasonable explanations for the sightings were offered. Skeptics suggested that planes, balloons, satellites, the planet Venus, etc, could explain away the accounts. Considering all of the information available, researchers could find only one object that could mimic the movements of the UFO, a blimp. All blimp manufacturers and pilots were contacted, and not one case of a blimp over the area on the nights of the sightings could be found. The Hudson Valley sightings are still a mystery to this day.